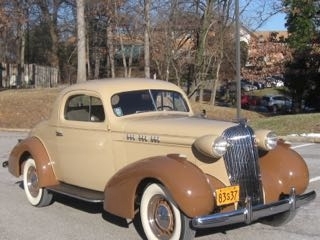 By 1936 Oldsmobile had been producing a wide variety of models for the better part of four decades. 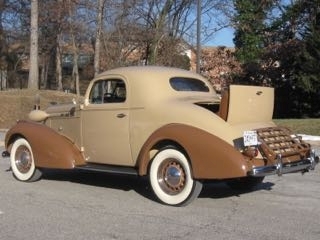 Records indicate that one of the more than 200,000 Oldsmobiles of all models manufactured in 1936 was an “F” series Sport Coupe with a rumble seat. During the next 78 years six different owners took care of the car through good times and bad. All six owners lived in Pennsylvania. Then, after a through restoration, the car in October 2014 was taken to an antique car show and put up for sale. That is where Randy Denchfield first saw the beautifully restored three-window Oldsmobile Sport Coupe. Denchfield, has long been attracted to three window coupes regardless of pedigree. A lengthy discussion with the owner took place inside the Oldsmobile because of a passing rain shower. Denchfield gave the owner a cash deposit. The next weekend Denchfield drove to Scranton, PA., pulling a trailer. He claimed his 3,054-pound prize, becoming the seventh owner, and towed it home to Chevy Chase, MD. Since he now has more time to thoroughly inspect his Oldsmobile Sport Coupe he has found no surprises, unpleasant or otherwise. He has learned that Oldsmobile built 2,838 cars like his, each one with a six-cylinder engine developing 95 horsepower. The advertised base price on such a vehicle was $739. To help the engine breathe both sides of the engine hood were ventilated with three sets of louvers. Mounted atop the engine is the oil bath air cleaner. The sporty Oldsmobile rides on 6.50x16-inch white sidewall tires supporting the car on a 115-inch wheelbase. Each wheel is dressed up with trim rings. Because this car is equipped with a rumble seat instead of a trunk the spare tire is mounted vertically inside the cabin in a compartment behind the passenger seat. Behind the driver's seat is another compartment where the jack and tools are stored. Both compartments are conveniently out of sight. Oldsmobile designers addressed the lack of cargo space on this model by installing a luggage rack on the rear of the car which can be folded close to the car when not in use. When the rack is in the horizontal position it can accommodate a small steamer trunk. Both side of the car have rubber covered running boards but Denchfield finds that entering and exiting the cozy cabin is easier be stepping over the running board. Once inside the cabin the craftsmanship of the restorer is evident from top to bottom. Denchfield marvels at the attention to details. Although the needle on the speedometer is ready to climb to 100 miles per hour Denchfield doubts that his car has ever come close to such a speed, “It won't go over 60, I'm sure,” Denchfield says. Steering the car requires some muscle and determination to turn the shoulder-wide banjo-spoke steering wheel. The task of stopping the car is made easier because it is equipped with hydraulic brakes. The three-speed manual transmission is shifted through the gears via the gear shift lever sprouting from the floor. Inserting the key into the ignition slot on the dashboard is required but that along will not start the Oldsmobile. The starter, located above the accelerator pedal, must be stepped upon. Ventilation is provided by the cowl ventilator and both doors also have enormous vent windows which car be cranked open to direct air into the cabin. Not anywhere near the two-piece, 10-inch high, windshield can a defroster vent be located. However, under the passenger side of the dashboard is a two-door heater. Located in the center of the dashboard near the ignition, cigarette lighter and throttle is the AM radio.